This little pouch is beautiful and very well-made. And it arrived much quicker than I expected. This was bought as a present for my sister-in-law. Loved it! wonderful quality! exactly what I wanted. This little bag is currently enjoying a little bit of fame in the gift guide of this months Inside Crochet Magazine. 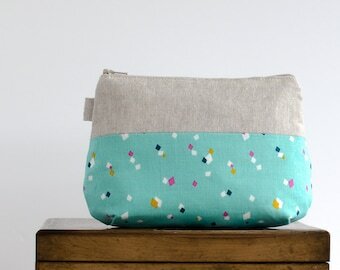 On their way to lovely customers, grey dot make up bag and a larger version. The larger one is not a standard shop listing but if you'd like one just ask. I want to make purchasing from me as easy as possible so please do take a minute to read through my shop policies before making a purchase. Please do not return an item before emailing and any returned items should be in their original re saleable condition and packaging. Refunds will be issued once the item(s) has been returned to The Ochil Tree, return postage is the buyers responsibility. All my items will be carefully packaged and sent out within 48 hours of cleared payment. I use 1st class Royal Mail post for UK orders and Royal Mail Standard International for elsewhere. If you're in a desperate rush please let me know and I'll try my best to accommodate. My packaging materials are tissue paper, twine, brown paper and biodegradable shipping bags. Insurance is not included in my standard postage costs but there is an upgrade option for this in the shipping dropdown menu. I cannot be held responsible for any delays in the receiving your item if delayed by customs etc The buyer is responsible for any customs charges or taxes that may be incurred. All items are sold under the Laws of UK Legislation.